The 2.34-m Vainu Bappu Telescope (VBT) is situated in the Javadi hills of Tamilnadu, at an elevation of about 750 m above the mean sea level. It is operated as a National Facility for optical astronomy. It has two foci, an f/3.5 prime focus (with an image scale of 27 arcsec/mm) and an f/13 Cassegrain focus (with a scale of 6.7 arcsec/mm). At the prime focus, CCD cameras are used for imaging with various filters. A high resolution Echelle spectrometer is in operation where the light is fed through an optical fibre from the prime focus directly to the spectrograph slit. A spectral resolution of 70000 has been achieved with the spectrograph in the visible range. By narrowing the slit, it is possible to obtain a spectral resolution better than 100,000. 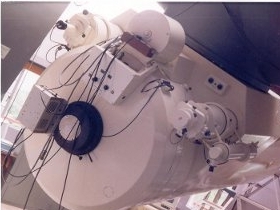 At the Cassegrain focus, an OMR spectrograph is used for low-to medium resolution spectroscopy. A Boller and Chivens CCD spectrograph earlier used for spectroscopy has been converted to a spectro-polarimeter. The 1m telescope at VBO was installed in 1972. The telescope has a Ritchey-Chretien F/13 optical configuration, with a primary mirror of 1.02m diameter and with a plate scale of 15.5 arcsec/mm. The telescope is attached with a stellar optical polarimeter and a medium resolution UAGS spectrograph. 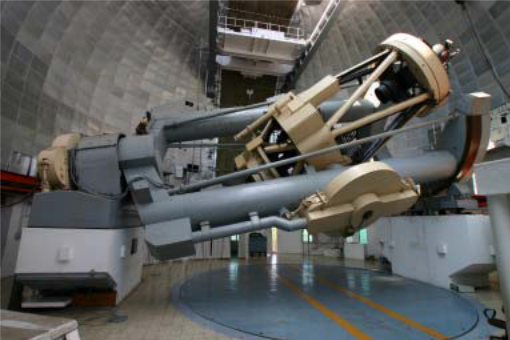 Proposals are invited for telescope time on the 2.3m VBT (National) and the 1m Zeiss telescope (IIA only). On the 1.3m JCBT, 20% time is available for non-IIA proposals. The observing cycles are for a 4-month period, and proposals are invited three times a year. The three cycle periods and their corresponding deadlines are given below. 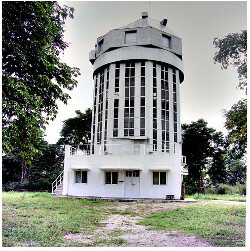 The Vainu Bappu Observatory is located about 175 km south-east of Bangalore, and about 200 km south-west of Chennai (formerly Madras). Peninsular India is usually hit by two monsoons in a year - the southwest monsoon starting around the beginning of June, and the northeast monsoon which settles in around the end of October. The peak observing season is January - April or May. The telescope seeing at the Zeiss 1m telescope is very close to the site seeing and is in the range of ~0".8-2" (FWHM), 1.5" being typical. The dome + mirror seeing at the Vainu Bappu Telescope (VBT) is somewhat worse; the range is ~1"-3" (FWHM), with ~2".5 being the typical value. The nearest airport to VBO is Bangalore, which besides being an international airport, is connected by direct flights to Chennai (formerly Madras), Mumbai (formerly Bombay), New Delhi and Kolkata. The nearest train stations are Vaniyambadi (29km from VBO) and Jolarpettai (46km from VBO), which have connections from Bangalore, Chennai , Mumbai and New Delhi. The VBO, located near the village of Kavalur, may be reached by road from Bangalore, via Hosur-Krishnagiri-Vaniyambadi-Alangayam-Kavalur. The night sky can be seen through the 15cm telescope on every Saturday from 7 PM to 10 PM, if the sky is clear. Vainu Bappu Observatory is 11 Kms from Alangayam, which is 18 Kms from Vaniyambadi. Vaniyambadi is on the Vellore-Bangalore highway.